Length Overall: 112 cm. Blade: 87 cm. Condition Excavated, with moderate pitting. The blade of this sword shows a lenticular to hexagonal cross section and tapers along fairly straight lines from a width of 3.9 cm. where it meets the crossguard to an acute point. The grip would have been 18.5 cm. in length, generous for a hand and a half sword. This slender profile, taken in conjunction with the cross section, permits assignment of this sword into Oakeshott's type XVII. Oakeshott (1964), page 66, declared this type to be "essentially a thrusting sword" developed at the height of complete plate armour. 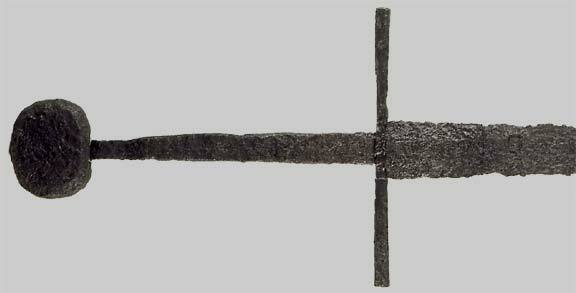 The long iron crossguard has an octagonal cross-section and widens slightly towards either end. The large iron pommel is oval, shorter than it is wide, and with chamfered edges; and is therefore of Oakeshott's type H1, a type generally not expected before the mid 14th century. J. F. Hayward, writing in the catalogue of the Kienbusch collection, page 153, opined that such pommels were particularly popular in England in the second half of the 14th century, on the basis of the number of such pommels depicted on monumental brasses of the period.